The best there was, the best there is, and the best there ever will be is returning to WWE television this Monday. 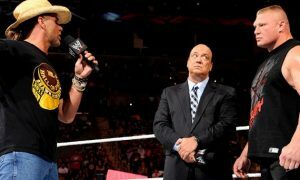 Nope, Bret Hart will not be participating in the 2011 WWE Draft. Instead, Bret Hart will be appearing on WWE Tough Enough alongside one of his toughest rivals. The Stone Cold Steve Austin-Bret Hart reunion will take place on the fourth episode of Tough Enough. 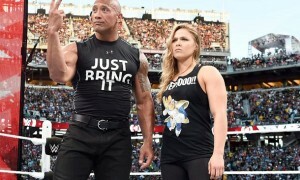 Ironically this is far from the first reunion between these two great foes since their last WWE match in 1997. Steve Austin and Hart have appeared together several times including the WWE Hall of Fame, RAW, and WrestleMania 26. There isn’t a whole lot known about Bret Hart’s appearance on the show. Quite honestly, if you haven’t visited the USA Network Tough Enough website you would have no idea that Bret was going to be on Monday’s show. The front page of the website features a small blurb promoting The Hitman’s Tough Enough appearance this Monday. “When time is up for elimination, the contestants are stunned by a shocking announcement from Steve. WWE Hall of Famer Bret Hart guest stars!” That is some preview! With Tough Enough ratings declining by the week for the reality show competition, the lack of promotion for one of the most popular pro wrestlers of all time is just stunning. Additionally, as of this writing there is no mention at all of Hart’s appearance on the program by WWE.com. This would be like Madonna appearing on American Idol with no promotion other than a tiny blurb on Fox’s Idol website. There certainly seems to be a disconnect between the WWE and Tough Enough productions in promoting the program. Arguably the most famous WWE Diva of all time Stacy Keibler appeared on Tough Enough last week with WWE superstar The Big Show. Yet on WWE television and even in the Tough Enough previews, only Show’s appearance was promoted. Why neither show would promote such a big appearance is simply mind boggling to me. So for you Bret Hart fans that have been waiting to see the WWE Hall of Fame wrestler back on television, hopefully you stumbled across this blog or caught the news on the Tough Enough website. I wouldn’t expect a new chapter in the Austin vs. Hart feud but it will certainly be an iconic moment seeing the two of them together again. Bret has appeared sporadically on WWE television since his return in January 2010. Bret ended an intense feud 12-year with Vince McMahon when he returned in 2010 to turn that feud into a fictional storyline at WrestleMania 26. Bret returned to the ring last summer as part of the SummerSlam main-event and disappeared shortly thereafter. 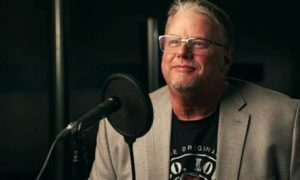 Bret’s appearance on Tough Enough would be his first WWE TV appearance since last August when he was scheduled to wrestle The Undertaker in a match that never started due to interference from Nexus.